The Personal transportation is a key interesting sector which gets attention from investors, marketing guys, manufacturers, suppliers and of course public in general. Due to space crunch in urban areas and access to sufficient infrastructure, the flying vehicle concepts could become a preferred mode of transport in future. Past few years, we have seen a drastic increase in the technology development of electric vehicles and personal mobility and people eager to see some concrete realization of practical concepts. 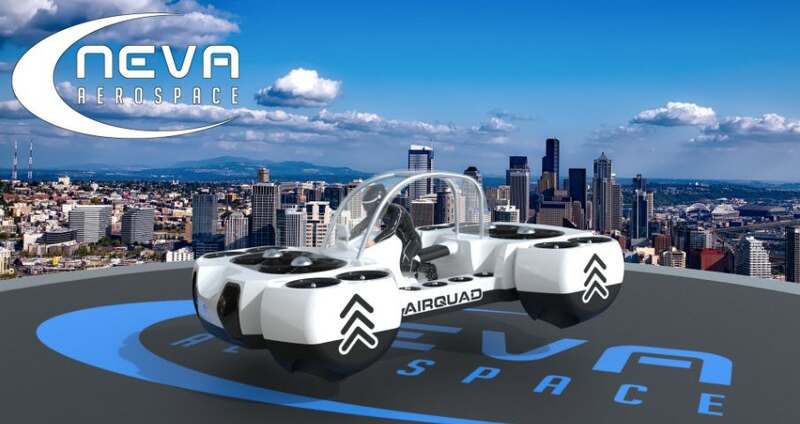 Now, Neva Aerospace, a European consortium based in the United Kingdom aims to revolutionize the personal transportation, that’s in an air...! Neva Aerospace develops technologies for unmanned air vehicles (UAVs), unmanned air cargo (VAC), aerial robotic platforms (APR), and electric aviation. It is emerging as the realistic front runner for heavy duty electric and hybrid aviation! Its latest invention, ‘AirQuadOne’ could be a game-changing the commercial concept for personal manned aircraft and will be shared with visitors at the Paris Air Show during 19-25 June 2017. AirQuadOne, the first ‘flying quad’ benefits from the vertical take-off & landing (VTOL) and power capabilities of Neva’s static thrust electric turbofan (ETF) technologies. According to the company, the fully-electrical vehicle is expected to weigh around 530 kg, can carry a payload of up to 100 kg (220 lb) and expected to be certified under Light Aircraft Certification within the USA (FAA) and EU (EASA). The flying vehicle will have a flight time of 20-30 minutes while its hybrid version could provide flight time around 60 minutes using current battery technology. It will fly with a linear flight speed up to 80 km/h (50 mph) and go up to 3,000 ft (914 m) altitude. Packed with 150 kg battery, is expected to be compatible with electric cars’ recharging stations, through direct wire connection, induction or a battery pack switch. Due to adequate lifting capability, it could replace cranes and helicopters or emergency cars in future.